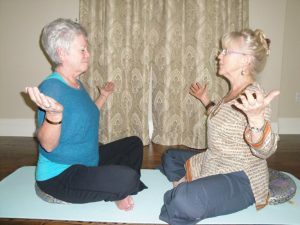 Yoga Therapy, derived from the Yoga tradition of Patanjali and the Ayurvedic system refers to the adaption of the practices of Yoga to help those facing health challenges manage their condition. The yogic path to healing is a holistic approach that recognizes that the human system is comprised of different dimensions inseparable from each other. Tools of yoga are used to address all dimensions of our system: body, breath, mind, personality and emotions with the understanding that if the body is less stressed, so too will be the mind, the emotions etc. Tools of yoga include, conscious breathing, meditation, lifestyle and dietary changes, visualization, the use of sound, modified postures and any combination thereof. Practices are designed in concert with the client, specific to their abilities. Sessions are conducted privately or in a therapeutic group class for similar concerns (e.g. asthma, back pain, chronic fatigue). 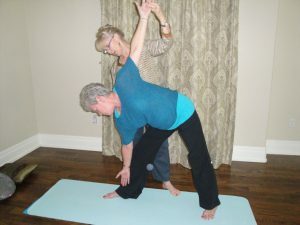 Yoga Therapy aims to empower people in their healing process. Each customized practice is designed for busy lives, and available energy. Practice and participation by the student is essential for healing. Yoga Therapy aims to reduce suffering. It is effective in helping people; become physically stronger, mange stress, shift negative attitudes, cope with anxiety and depression, increase energy and make needed lifestyle changes. From a medical standpoint it is a recognized support for the parasympathetic nervous system, which aids in all healing. I can’t believe these simple movements are making my back feel so much better, it’s amazing! Life can be hard: When it was hard for me my yoga teacher gave me practices to adhere too. In retrospect they held me together, and I wonder what do others do when it’s hard.